IAAF president Sebastian Coe greets Bolt on arrival at the National Stadium as Jamaica’s prime minister Andrew Holness looks on. 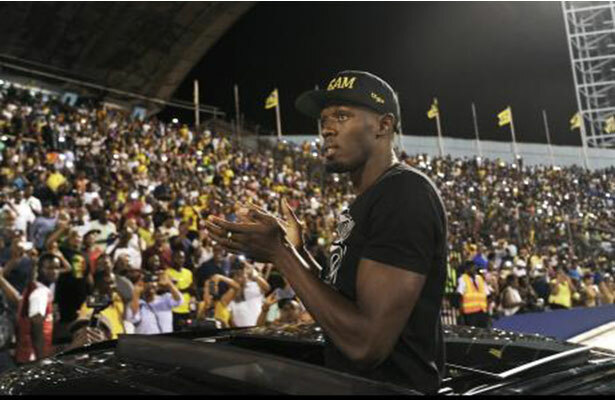 Jamaica gave its sprint king, Usain Bolt, a grand send-off party, complete with speeches, dancehall music, and fireworks at the Racers Grand Prix in Kingston last night (June 10). The double world record holder was running his first individual race of the season and his last on his home soil before he retires from the sport after he competes at the IAAF World Championships in London this August. 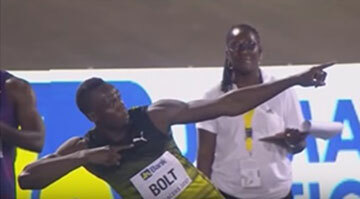 As World defending champion of the 100m and 200m, Bolt has an automatic entry into both races and has, therefore, chosen to skip the Jamaica National Trials in two weeks, which is used to select the team to London. 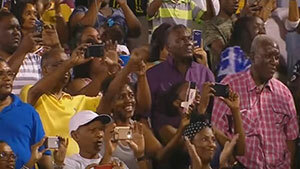 Adoring fans capture the moment. Adding to the splendor of the occasion was the presence of a number of world-class athletes from as far as Australia and South Africa, who journeyed to the island to compete and honor the member of their track and field fraternity, whom some have made known they love, respect and thank for what he has brought to the sport. Among the stars competing in Jamaica were Mo Farah, Britain’s Olympic 5,000m and 10,000m champion; Sally Pearson, Australia’s World and Olympic sprint hurdler champion; Wade van Niekerk, South Africa’s 400m world record holder; David Rudisha, Kenya’s 800m world record holder; and Allyson Felix, USA’s 200m-400m specialist and World and Olympic champion. Those nerve-wracking moments were evident as he lined up in the blocks looking uncharacteristically solemn without even a faint smile. The usually animated sprinter soon waved to spectators on introduction, then finally did his shadow boxing relaxation ritual as the introductions continued and delivered his customary “to-the-word” sign just before kneeling in the blocks. His last post-race “To-The-World” in Jamaica. Reflecting on his execution, the superstar assessed his own performance: “My start was poor, as always, and I think in the last part I lost it a little bit,” he said, pointing out that he wasn’t expecting anything spectacular, as it was his first race since January after a 150m race in Australia at the Nitro meet. 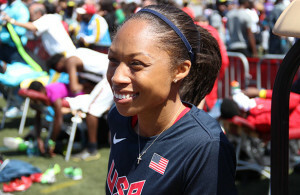 He was thankful to be able to run, stay injury-free, and put on a show for the crowd. He thanked them profusely for having supported him over the years. Bolt also spoke about how the death in April of his close friend, Olympic high jump silver medalist Germaine Mason, impacted him. 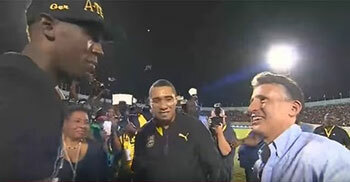 After the gushing honors from his coach and other dignitaries led by Jamaica’s Prime Minister Andrew Holness and International Association of Athletics Federations (IAAF) president Sebastian Coe, and after his warm-down session barely ended, a roster of dancehall artistes affectionately pulled the sweaty Bolt into demonstrating how current he was with his dance moves as they circled him.